Over the past week, parts of the yield curve have inverted for the first time since prior to the ’08 financial crisis. Many investors view an inverted yield curve as one of the first indications that the economy is entering into a recession. While it does have some historical importance, the actual significance is much more nuanced. Last week, one measure of the yield curve inverted for the first time since 2007. Prices on the 10 year US Treasury bond rallied, and as a result its yield fell substantially below the yields on shorter term bonds. There are many ways to interpret an inverted yield curve, but before we get too deep into the discussion, let’s take a step back. First of all, the “Yield Curve” is simply a graph of yield versus maturity. Yields go from low-to-high on the y-axis (up and down), while maturities are shown from short to long along the x-axis (left-to-right). Yield curves can be plotted for a variety of instruments: US Treasury Bonds, Certificates of Deposits, Corporate Bonds, International Bonds, etc. However, for this publication, when referring to the “yield curve” we are referring to yields on US Treasury bonds. The difference between a “Normal” and “Inverted” yield curve is shown in the chart above, courtesy of Seeking Alpha. In a normal environment, an investor would expect to get a higher interest rate for a longer-term investment. A 5-year CD from a bank should pay you more than your savings account. This is a “Normal” yield curve. However, if your savings account paid 3%, but that same 5-year CD paid only 1%, then the yield curve is “inverted”, as the longer-term investment pays less. It is fairly rare to see an interest rates with these characteristics. An inverted yield curve is rare because inflation and the time value of money suggest longer dated bonds should yield more than shorter dated ones. Yield curve inversions are not just a reflection of the current interest rate environment. The yield curve is also known as the “recession indicator”, as it has been a fairly good predictor of an impending recession. However, like most things in the investment world, reality is more nuanced than what you’ll find on CNBC. One nuance is the fact that multiple time-frames that can become inverted. There is not just one yield curve; it is a collection of multiple data points. The next chart below shows the recent history of different Treasury yields, as well as the Fed Funds rate. To read this chart, simply look at the number after the “DGS” in the Chart Key. “DGS3MO” is the 3-month Treasury yield. “DGS1” is the 1-year, “DGS2” is the 2-year, and so on. For the first time since 2017, short term Treasury yields are at the same level as the current Fed Funds target, suggesting equilibrium there. This is likely the primary reason the Fed did not raise rates recently (their latest meeting was Mar 20), and it is a very good reason to expect no further rate raises in 2019. In fact, if the short end of the curve starts to follow the long end lower in yield, it would be a clue the Fed will indeed cut rates later this year. Another nuance of the yield curve is how yields are inter-related to other assets, specifically stocks. 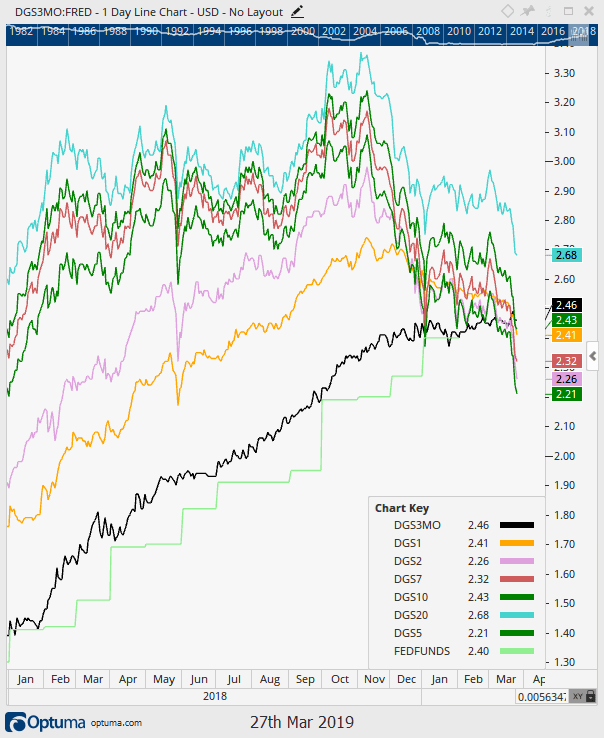 Notice on the chart starting near the peak of equities, back in September of 2018, the longer dated bonds (the 5, 7, 10, and 20 years) all started to fall in yield while the 3 month (shown in black) has barely budged. One reason for the move higher in Treasury bonds is lowered earnings expectations from the likes of FedEx, Delta, and virtually all of the semiconductor manufacturers, as investors took assets out of the stock market and put it into the bond market. It is not just the US that is showing signs of stress. German “bunds” have also been bid precipitously and are once again trading at negative yields. In fact over $10 Trillion worth of bonds around the world are currently trading at negative yields. 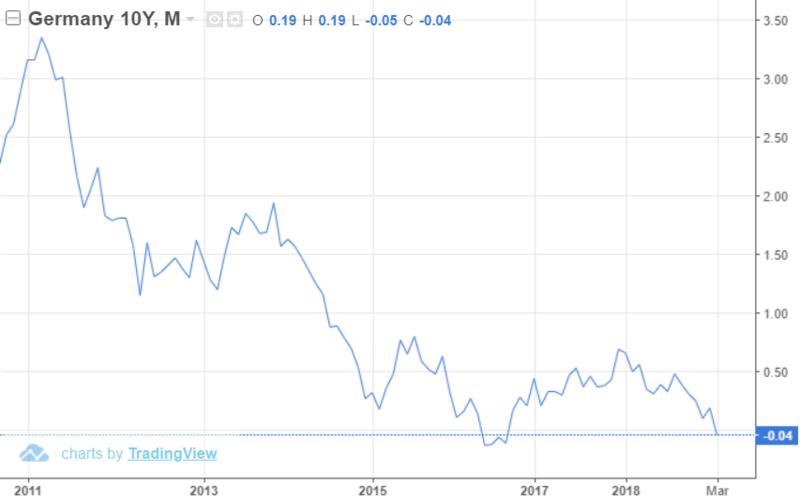 This occurs when a bond is issued at a nominal yield (for instance a 10 year German Bund issued at 2% in Dec 2011) but is then bid up in price to the point its yield to maturity turns negative. The 10 year German Bund today has a coupon rate of just 0.25%, so it will not take much demand to push those yields into negative territory. The next chart shows the effective rate of the German Bund. Notice the negative territory today as these bonds have also gotten a boost in buyers in the 1Q. Why in the world would someone buy a negative yielding instrument? A buyer that has no choice, like a central bank or a hedge fund. Other examples could be those entities with mandates, like an endowment fund that requires 3-5% of its portfolio in Treasury assets at all times or a passively managed Treasury ETF, such as IEF or TLT, which must always own the Treasury asset class in their mandate. A foreign investor who could offset the negative yield with a currency gain. There is a complex theory in finance known as interest rate parity which essentially suggests that interest rates in countries are affected by those same countries’ currency exchange and forward rates. These investors may be fine with the loss in yield, expecting the currency gains to more than offset. An investor may think that a negative yield is better than what could be a larger loss elsewhere, a play on risk expectations. In other words, there is no better alternative, and they may see parking funds on the sidelines for 5 years at a slightly negative rate as more attractive than parking it elsewhere with unknown risks. An expected period of deflation could be an example of this. Although an investor in a 5 year German Bund with a 0.0% coupon today may not expect to make any money in their bonds, they may expect to be able to buy more once the principal comes due in 5 years because deflation has lowered prices of all the alternatives around them. This 3rd scenario, deflation, largely explains our current predicament in the U.S and the World. It seems growth expectations continue to come down. The Atlanta Fed recently projected just a 0.5% 1Q GDP growth rate, sparking some fears again around deflation. In addition, and contrary to what Alan Greenspan, Ben Bernanke, and Janet Yellen have all testified during similar times of inversion (thus the two quotes to open this section), there is some merit to being worried about the inversion of the yield curve as it does have a solid predictive history, but it also directly affects some industries. One example is in the banking sector. Banks borrow at short term rates (like the 3 month Treasury curently @ 2.41%) and lend at longer term rates (like the 30 year mortgage currently costing around 4%+). The longer short term rates stay elevated compared to longer term rates, the more pressure is put on banks as their margins are squeezed. This could ultimately be a cause of a recession if banks tighten up their lending enough to slow growth. 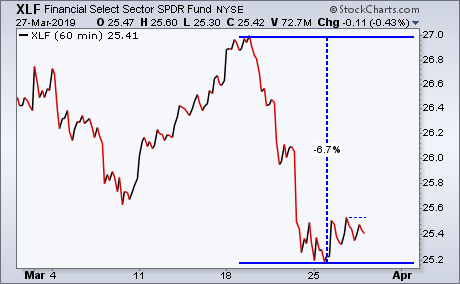 Indeed, we have seen bank stocks hammered of late with the inverted yield curve as the chart of XLF (the financials sector ETF) reveals over 6% decline in less than two weeks. It seems the market is pricing in such a scenario of slowed lending and less profit for the banks, but so far the broader market as a whole has not responded much to the inversion. Should we be scared about an inverted yield curve? The stock market’s price will tell us when we are nearing a recession, and more importantly for our readers, a bear market. Thus far this has not occurred as prices maintain their rebounded levels off the December lows. A look at history reveals the inversion of the yield curve itself is not that big of a deal to the stock market. 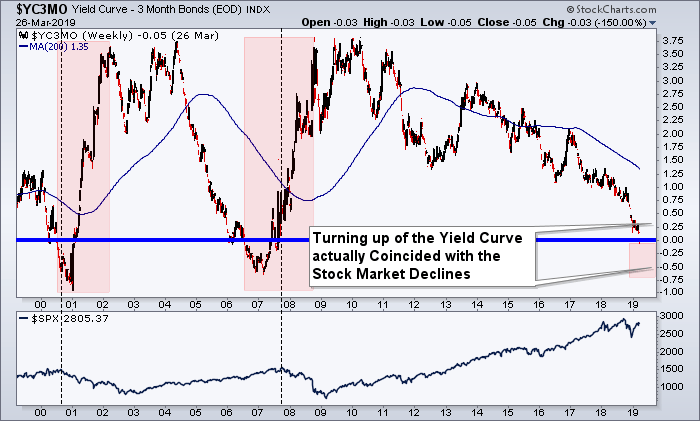 The final chart below points out other times the 3 month yield was above the 10 year yield (below the blue line at 0%). But it is a big deal when that inversion occurs and then the Treasury market comes out of that inversion. History suggests that will be the real test. It may be because we are coming out of the inversion or just the lag on the inverted curve, but regardless, the stock market selloffs of 2000 and 2007 did not occur until the yield curve had already inverted and started to normalize. In other words, this bull market could continue longer, as it did in 2006 and 2007. The fact is, an inverted yield curve itself is not cause for worry, at least not immediately. There is a lag between the time the curve inverts and the start of a recession. The proper time to become worried is once the yield curve normalizes after becoming inverted. When the short end starts to join the long end and stocks start to sell off, then we will get more worried about the inversion. Either way, the fact that parts of the yield curve are starting to invert is yet another sign that says we are late in this investment cycle. There remains decent upside return potential, but risks are elevated, and will be until the next bear market occurs.